The Liberty Seated Quarter Top 25 Variety Set appeared in Gobrecht Journal Issue 111 following a lengthy period of preparation and development and a great deal of help and input from many sources. The intention for this column going forward is to take advantage of our editor’s indulgence and flexibility in using this space to add to the information presented in the Gobrecht Journal article. The “Top 25” will be presented at the rate of about one per month with additional photos, attribution tips, updated information and anecdotal stories as appropriate. The first variety is the 1839 very long claws. The photos presented here illustrate each of the three 1839 reverses – open claws (Figure 1), closed claws (Figure 2), and very long claws (Figure 3). Presumably the photos make the comparison and attribution of the different varieties straightforward without a great deal of explanation. Note the weakness in the left (facing) leg of the eagle – a feature common to all very long claws examples seen to date. The key to attribution, however, is the far left (facing) claw, which appears notably different for each of the varieties. It has been suggested that there are two distinct obverses paired with the very long claws reverse – one having the large beaded border (very rare) and the other having more typical denticles (merely scarce). 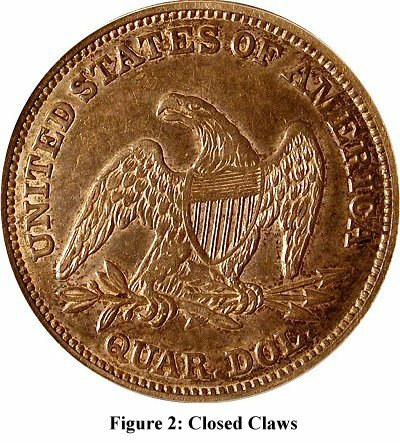 Though I am not convinced that this is the case, the source of this suggestion is a most reliable and knowledgeable numismatist, and I cannot discount the possibility. 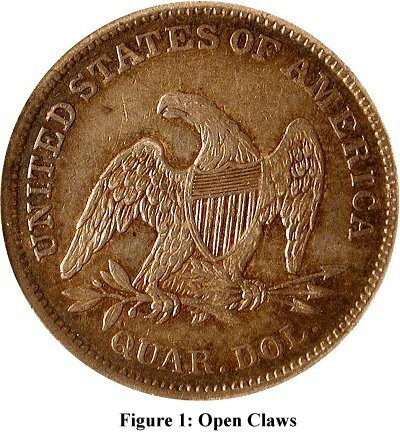 The competing theory is that described in the Gobrecht Journal article that for some reason the denticles were struck higher than the rim around a portion of the coin’s obverse and that uneven wear makes the same obverse appear different depending on wear. 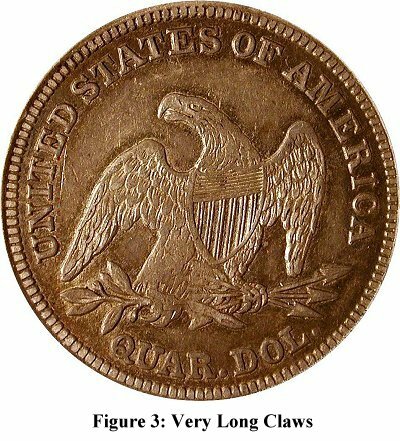 I continue to search for the coins that can be compared side-by-side to unequivocally prove that there are in fact two distinct obverses paired with the very long claws reverse. If anyone can provide such a comparison please get in touch with me through the e-Gobrecht editor or on the LSCC message board.